CLO is a structured financial product that pools together cash flow-generating assets and repackages this asset pool into discrete tranches that can be sold to investors. 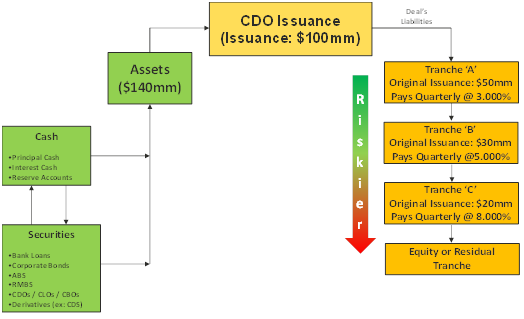 The tranches in a CDO vary substantially in their risk profile. The senior tranches are relatively safer because they have first priority on the collateral in the event of default. As a result, the senior tranches of a CDO generally have a higher credit rating and offer lower coupon rates than the junior tranches, which offer higher coupon rates to compensate for their higher default risk. The total assets always exceed the liability issues, sometimes by over 30% to 50%. This allows for some of the collateral to default without the integrity of the deal structure being affected. A collateralized loan obligation (CLO) is structured with the asset pool primarily consisting of secondary bank loans, which serve as the debt obligations of the CLO. The CDO/CLO deals are issued with a set of rules (compliance rules, payment rules, business rules, rating notching rules, etc. ), guidelines, roles & dates (determination period/dates, payment dates, CDO/CLO Lifecycle dates, etc.). The deal’s indenture is considered as the ‘bible’ to the deal and has final say as to all activities within the deal (ex - how and when to start paying down the liabilities). To make changes to the deal’s collateral inventory the collateral manager proposes trades to the deal to see what the effect on compliance will be. This is called hypothetical or what-if trading. A hypothetical trade can be a single trade (buy or sell one security) or a combination of trades (buy or sell multiple securities). The collateral manager informs the trustee which proposed scenarios to actually trade. When the trustee receives the trading scenario they re-run compliance to make sure the scenario still fits within the deal. Once compliance is satisfied the trade is settled.